This will be the space agency's first attempt at landing on Mars since the Curiosity rover in 2012. After a roughly 300-million-mile journey lasting more than six months, a new NASA probe is set to touch down on Mars next week, beginning a two-year mission to peer deep inside the red planet’s interior. The Mars InSight lander, which launched into space in May from Vandenberg Air Force Base in California, is scheduled to touch down just north of the Martian equator around 3 p.m. EST on Nov. 26. The landing coverage starts at 2 p.m. EST and will be available to watch on NASA TV. Having a big target makes things a bit easier, but it doesn’t mean the landing will succeed. NASA has lost Mars-bound spacecraft before, including the Mars Polar Lander in December 1999, and a complex sequence of steps must go right for the touchdown to be successful. 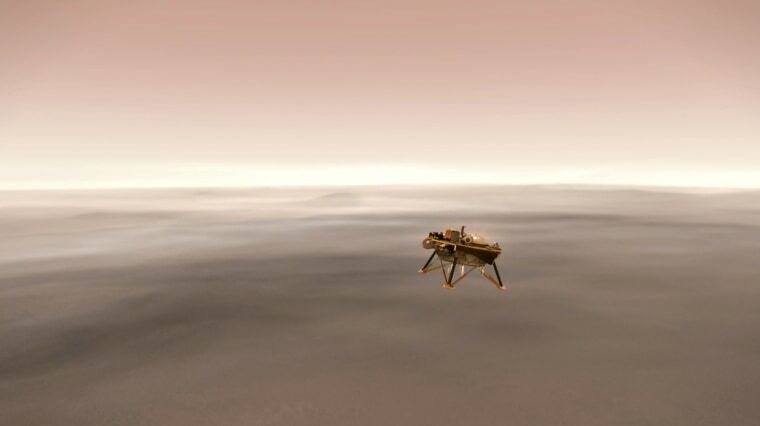 About seven minutes before it reaches the top of Mars' atmosphere, the InSight lander will be released from the spacecraft that ferried it to Mars. Ensconced inside its heat-protecting “aeroshell” capsule, the 800-pound lander will descend 70 miles through the thin Martian atmosphere for about six minutes. Then, a supersonic parachute and a series of descent engines will slow the spacecraft before it touches down on shock-absorbing legs. The InSight lander will be the first to study the red planet’s deep interior. The goal is to compare the interior of Mars to that of Earth so that scientists can better understand how these rocky worlds formed more than 4.5 billion years ago. In addition to its robotic arm, the lander is equipped with a seismometer and thermometer designed to measure the frequency and magnitude of marsquakes and show how heat from deep inside Mars makes its way to the surface. The InSight lander isn’t designed to search for life, but NASA says understanding Mars' geological evolution could offer clues about its present or past habitability. The agency is planning to launch a new rover to Mars in 2020 that will look for signs of past microbial life on the red planet.